Monsoon Meegs - 1992 - Christchurch Roller Derby. Strong City. Stronger Skaters. I am a huge fan of the British TV series "Absolutely Fabulous". Monsoon comes from Eddy Monsoon, the lead character, and my number is the year the show was first released. Running and jumping on my toe stops - I am really trying to work on this as I get frustrated when I can't do something! I saw a notice about Freshmeat and made some enquiries. I'm so glad I did as it is the most amazing, supportive group of people - one big family! 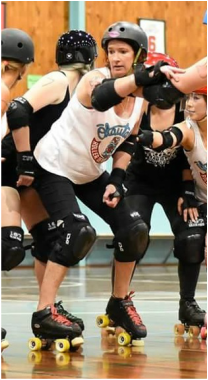 I love going to roller derby, largely because of the team, and it's a fun sport! Give it a go! It's heaps of fun! Apatosaurus - I just love the way the name sounds! Definitely 1 horse sized duck!